Naan — This grilled Indian bread is soft and a little chewy. My kids are absolutely ga-ga for it and ask me to buy it nearly every week. Pita pockets — There’s something about stuffing sandwich fillings inside a little pocket that makes them more fun. Pita pockets are great for looser fillings like tuna, egg or chicken salad that tend to fall out of regular bread when you take a bite. Flatbread — My oldest son likes his flatbread layered with ketchup and salami. (Blech!) If your kid isn’t a big weirdo (and I mean that in a loving, caring sort of way), you can use more traditional ingredients. Biscuits — This is a new favorite at our house. I buy the tubes of biscuits from the grocery store and bake them in the morning. We eat some with our breakfast and then at lunch time, I slice them in half and put ham and cheese inside. Yum! They’re also the perfect size for a bento box. Cresent rolls — Another bake-in-the-morning option, also sized right for a bento. Garlic toast — Technically this is sliced sandwich bread, but it’s so much more exciting than that. I spread regular bread with butter, sprinkle on a little garlic salt and then toast it in the toaster oven until it’s golden brown. Slap in a slice of cheese (and maybe even a little tomato) and your sandwich is suddenly fresh and delectable. Swap the peanut butter: try almond butter, sunflower butter or cream cheese instead. Swap the jelly: replace jelly or jam with raisins or thinly sliced fruits like bananas, apples or pears. Add this: this is going to sound totally weird, but add a few potato chips to a PB&J — the crunch is fun and your kids will think you’re a totally awesome rebel! You can’t really swap the chicken in a chicken salad, I don’t think. Maybe you could use turkey, tuna or eggs? Sorry, that’s not really very original…. Add this: chunks of apple, halved grapes, chopped celery, toasted almonds, curry powder, a spoonful of mango chutney or apricot jam. We’re big fans of the deconstructed sandwich around here. Roll up some deli meat, cut some sliced cheese into shapes with cookie cutters (or just into squares) and pop in a pile of crackers. I loved this idea from Food Momiac: Buy a refrigerated pizza crust and when you have a little extra time on the weekend bake it off into several 2-3 inch wide little crusts. Then pack the crusts into your kid’s lunchbox along with some spaghetti sauce, shredded cheese and mini pepperonis (or whatever topping he likes). Let your kid assemble his pizza at the lunch table. So fun! 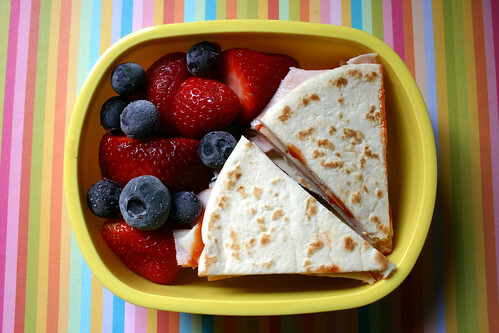 What do you do to shake up sandwiches in your lunches?